Forgotten is a short, eerie game by Sophia Park. Made using Twine, but playing like a point-and-click adventure, Forgotten shows what the slowly disintegrating world looks like inside "Frgtn.exe" and old, forgotten game found on some long abandoned 80s era computer. Its inhabitants, boss monsters that acquired some level of sentience and awareness of their situation, have been slowly losing their minds and bodies as their files corrupt. You enter, some mysterious stranger or unwitting player, perhaps having stumbled across this file. At first the inhabitants confuse you for the game's hero, Hex, but as you converse with them, you begin to understand the tragedy of their situation. The game is short, around 5 minutes for one playthrough, and the world itself contains only a handful of screens. 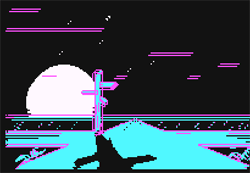 Gameplay is fairly simple, consisting of either moving your mouse to one of the screen edges to change location or clicking on text options on a side panel. That said, the game finds some clever ways to subvert your expectations on this control scheme and give you the feeling that something is just...off. There's a sense that you're just a witness to this world, quite possibly its last. The pixelated style of the artwork in this game, done by Arielle Grimes and sound design by Emilie Sovis create a sense of quiet desolation in this fantasy themed world, where once terrifying monsters are now withered remnants of their former selves. 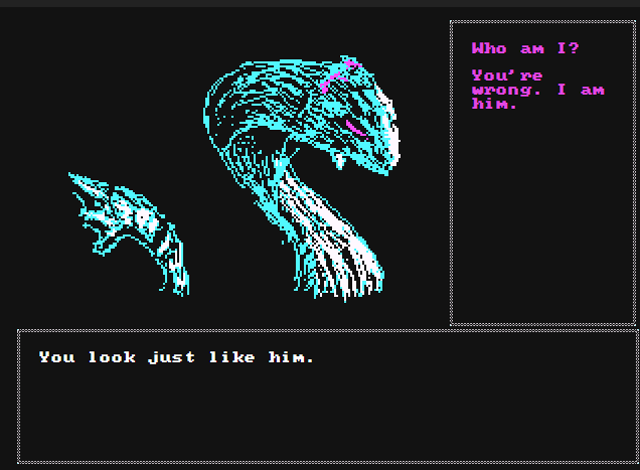 These monsters speak cryptically and their answers to your questions are vague at best, so each player must find their own interpretation of events or reflect on the meaning of this game. It's definitely worth two or three playthroughs, as the game changes each time, reflecting the gradual disintegration of this world, accelerated by your presence there. Forgotten is a mysterious and contemplative journey through a crumbling digital world, and though gameplay is sparse, its writing, artwork and sound design make it a uniquely compelling experience. Interesting concept - I liked the replay feature.